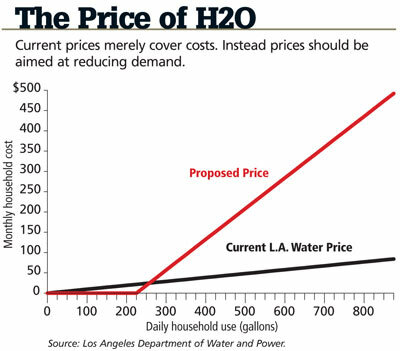 If water was priced to reflect scarcity, a decrease in supply would lead to an increase in price, and people would demand less. Consider another precious liquid: oil. Despite popular perception, there is no shortage of oil; supply does equal demand at the present price. It’s just that supply meets demand at a higher price than it did a few years ago. In a sensible water pricing system, everyone would be guaranteed a base quantity of water at a low price. Those who used more would face a steep price hike. As it stands, Los Angeles households pay $2.80 for the first 885 gallons they use per day. That’s enough water to fill 18 bathtubs. The next 18 tubs cost $3.40, which is only 20% more. Most L.A. households don’t even see this price increase, since the average household of three uses just 350 gallons–about seven bathtubs–each day. For that water, the household pays only $35 a month. If they use twice the amount, the bill merely doubles. I propose a system where every person gets the first 75 gallons, or 1.5 bathtubs, per day for free but pays $5.60 for each 75 gallons after that. Under my system, the monthly bill for the average household of three would come to $95. My system is designed to reduce demand rather than cover costs. Revenue paid by guzzlers would cover the costs of those who use only a small amount of water. Any leftover profits could be refunded to consumers or used to enhance the quality or quantity of the water supply. We can solve America’s water “shortage” in the same way that we would solve a shortage in any market. Increase prices until the quantity demanded falls to equal supply. This pricing system would ensure that everyone gets a basic allocation of cheap water while forcing guzzlers to pay a high price. Want to use more water? Pay for it. This entry was posted in Water Policy by Steve Darden. Bookmark the permalink.